Poll: Foreigner with the best shot? Your vote: Foreigner with the best shot? Two zergs in a group, no exit for you. Billowy has apparently taken a page out of Jaedong and TY's book and is going by his given name now (DoKyung). Group B is group of death, easily. It's basically the only group out of all of Code S that all 4 should advance to the top 16. Look at any other group and you can easily see clear winners and losers. That's not the case with Group B.
NoRegret might regret the group he ended up in. SortOf's is difficult too. Scarlet might have a decent chance though. So keen for this to start soon. No group of death here. Zest gonna lose cus no Protoss.to beat up on. Did tier 1 get to pick their groups? INno picking Creator is kinda weird when you think of it. Why not a zerg player instead? That's a very good tier system, none of the groups seem unbalanced. Only comment is that they lucked out with the Zest + Bunny pairing, and Maru is overrated a little perhaps but even that is debatable. I don't get why so many people think F is the toughest group, group E,D and G have at least 2 decent players while F only has one. Foreigners are looking good, really excited to see how this season turns out. Side note: It still feels weird seeing so many players without a team/sponsor. Dark, Trap and Byun are all very good if very inconsistent GSL players. Group F absolutely has the potential for some serious fireworks. Speaking of inconsistent yet talented, Group E is the one I want to watch. TY is the obvious favorite there, but literally none of those guys in that group are pushovers. 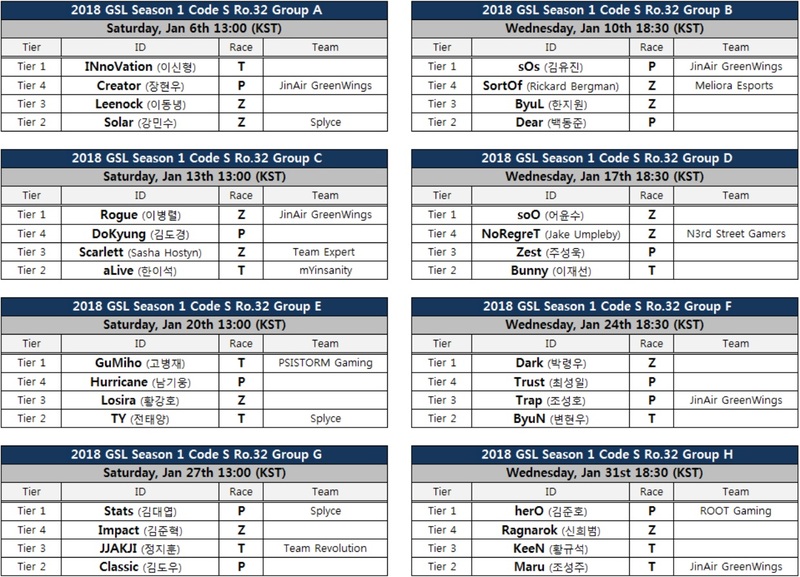 They are all old school GSL pros, and they are all very unpredictable in terms of what form they show up in. Was going to ask this exact same question. Since the top 4 from last season (Stats, Dark, sOs, Inno) had to requalify, wouldn't it also make sense if the finalists don't get to pick opponents? If not, either Inno knows something we don't, or he deliberately chose a tougher opponent in Creator instead of somebody like Sortof or Noregret. It's true they are good players but both Trap and Byun haven't had any considerable result in the entire 2017, and Byun barely made it out of the qualifiers so personally I don't have too much hope for this group. But still, it's gonna be a brand new year so who knows. And Byun was also literally GONE from the scene for a few years before suddenly re-emerging as hands down the best player of 2016. It's Byun, he's an unpredictable maniac, and we love him for that. Trap is bit of an odder enigma right now, he's been real silent over the last couple of years, around but not really making huge waves. Who knows, this meta is stronger for Protoss than it has been in a while, so who can really know how he'll fare in it.